Trust is something that should be earned through evidence of trustworthiness, security is not only about stopping terrorists who wish to main and kill; these two thoughts provide a context for Project Abacá “Technically Assisted Sensitivity Review of Digital Records” which the ITaaU is supporting. When discussing security we should not limit ourselves to considerations of criminality and terrorism; our societies security relies, at its deepest level, on the trust that the citizen places in the institutions of the state. Through the records of the state that it preserves, The National Archives is fundamental to this aspect of security. Moral philosopher Onora O’Neill in her inspiring TED talk and her earlier 2002 Reith lecture made compelling cases for trustworthiness (rather than just more trust). 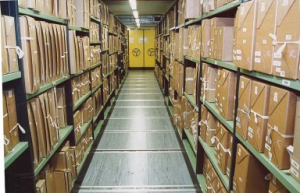 One good source of evidence for trustworthiness (or otherwise) is the evidence of normal organisational transactions held as records in an archive, such as the records of government held at The National Archives. Such archives provide the impartial witness that enables the executive to be held to account under the rule of law and in the court of history. They contain the evidence of actions of the executive, and the evidence of the decisions and policies enacted. This is central to Lord Bingham’s 4th Principle “Ministers and pubic officers at all levels must exercise the powers conferred on them in good faith, fairly, for the purpose for which the powers were conferred, without exceeding the limits of such powers and not unreasonably”. How can we know what the executive have done if the records are not kept and made open for citizens to inspect? In the past, government records were created and preserved on paper as memoranda, minutes, letters, ledgers etc. and released to public view after 30 years – as the enormous collection of public records held and viewable at The National Archives demonstrates. As you would expect, in recent years the records of government have become digital. The UK government adopted new technology through the 80s 90s and 00s, and these digital records produced by this technology are soon to begin transferring to The National archives as the old “30 year rule” progressively transitions to become the “20 year rule”. However, there is a challenge: before any records (paper or digital) can be transferred to The National Archives, they must be reviewed to ensure that they do not fall under an exemption in the Freedom of Information (see: Summer 2013 Newsletter). Digital records are much more numerous and also, as a result of the changes to the administrative practices of government departments that arose with their introduction, much less well organised. These, and other factors, mean that there is the prospect that difficulties in sensitivity review may result in large swathes of digital records being withheld from public view for long periods of time. The ITaaU is supporting Project Abacá to investigate and mitigate these challenges by funding a case study to begin to evaluate the project’s proof-of-concept tools and methods to deliver “ Technically Assisted Sensitivity Review of Digital Records”. More details can be found on the Project Website, and we will be posting other blog posts soon giving more details of our work. This entry was posted in News on July 23, 2014 by Stephen Brewer.